What Do The Colors And Symbols Of The Flag Of Nepal Mean? The flag of Nepal is unique in that it is the only flag in the world that is non-quadrilateral in shape. The current flag of Nepal was adopted on in 1962. Nepal is a South Asian landlocked nation located in the Himalayan region. The country has an estimated population of 26.4 million and occupies an area of 147,181 square km. Prior to the establishment of British rule in much of the Indian subcontinent, Nepal was one of the many independent states in the region. Nepal had its own flag representing the ruling dynasty of the region. During the British rule, Nepal managed to remain independent although it served as a buffer state between China and India. 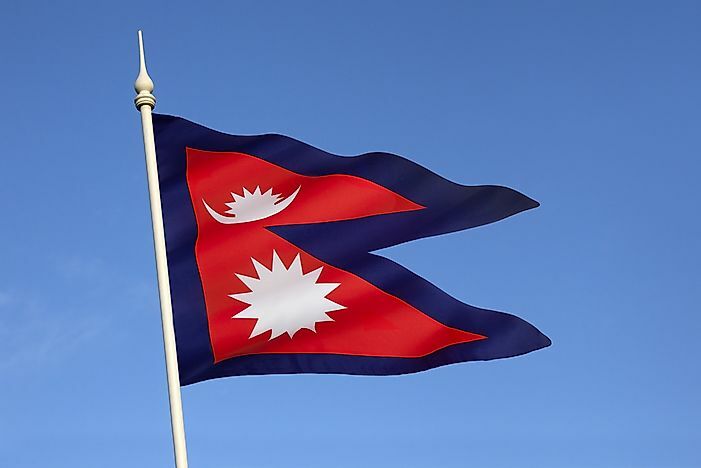 Despite the fact that flags of most other countries in the region were replaced by the flag of Imperial Britain during the colonial rule, Nepal managed to keep its traditional flag. There were, however, some changes incorporated in the flag of Nepal over the centuries. The present version flag was formally adopted on December 16, 1962. The flag of Nepal is unique in that it is the only flag in the world that is non-quadrilateral in shape. It is, in fact, a combination of two pennons or pennants that form a double pennon. Originally, the flag had two separate pennons that represented the Rana Dynasty’s rival branches. In the last century, the two pennons were joined together but the new version of the flag was only adopted in 1962 when a constitutional form of government was established in Nepal. A pennon refers to a flag that is larger at the hoist than at the fly. The upper section of the flag is thus smaller than the lower one. The background color of the flag is crimson. The borders of the entire flag are in blue. The upper segment of the flag features a stylized moon. The lower segment has a white sun with 12 rays. Prior to 1962, the emblems of the flag, that is, the moon and the sun featured faces of humans. These were, however, removed in the modern version to modernize the flag. Every part of the flag has its own meaning. The triangular shape of the flag’s pennons symbolizes the Himalayas. The crimson red color of the flag represents the color of Nepal’s national flower, the rhododendron. It is also believed to symbolize the bravery of the people of the country. The blue border represents the color of peace and harmony according to Nepali culture. The celestial bodies in the Nepalese flag are indicators of the permanence of the Himalayan nation. Just like the sun and the moon, the country will survive for ages. The moon is also an indicator of purity and calmness of the people of Nepal. At the same time, their fierce determination is symbolized by the stylized sun. The moon and the sun also represent the variable climate of the country. They represent the cool weather of the mountains and the warm weather of the Terai lowlands of Nepal, respectively.